There are so many bone broth benefits! Chicken and beef bone broth help with joints, gut issues, illnesses, and many other things. Grandma and the Chinese are right. If you are sick or exhausted, bone broth is the way to go! Chicken bone broth (or just bone broth) is one of the main foundations in Traditional Chinese Medicine and has been for centuries. When we lived in China, most of their meals were served with bone broth soup. I always avoided it because of the MSG they may have added. But since returning to the US, I have become an avid bone broth maker. Bone broth is one of the most healing and nutrient dense things you can consume. When you cook chicken or chicken bones in water for several hours, the nutrients and goodness are leeched out of the bones and put into the liquid. The Chinese also say other health benefits of bone broth include it being great for your kidneys, liver, spleen and lungs. In addition, it is high in many healthy minerals, and is said to help your joints, hair, and skin. I personally have seen a difference in my skin and joints. You can read more here about using bone broth in joint pain relief. Chicken broth is great instead of water added to many recipes like soups, stews, rice, etc. It adds a nice flavor, as well as amazing nutrients for your body. 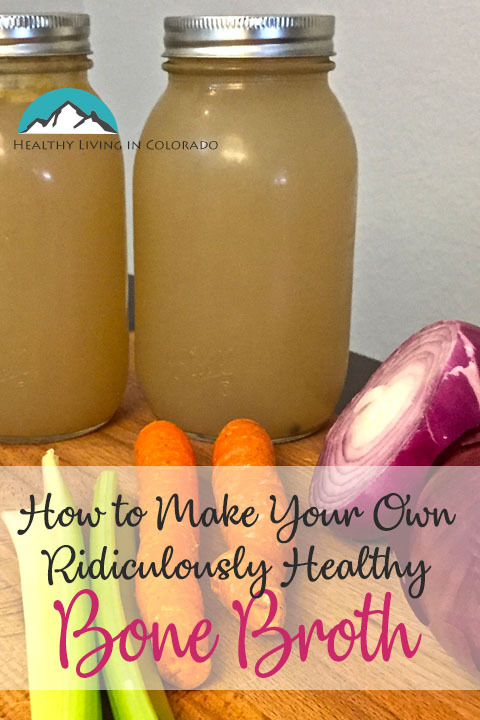 I have tried making bone broth several different ways, and the 2 easiest, most delicious way I have found so far are below. These also work as bone broth recipe for leaky gut. You can read more about my experience with leaky gut here. This could be a whole chicken, thighs, legs: Cook the chicken however you want to, then save all the bones. 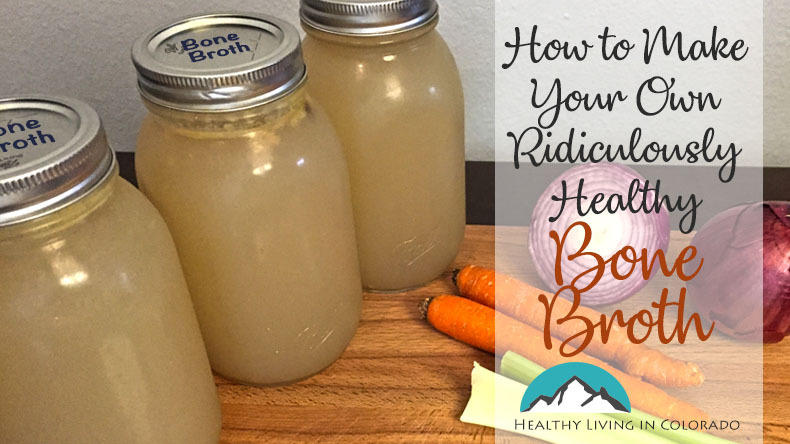 Crock pot bone broth is really easy! 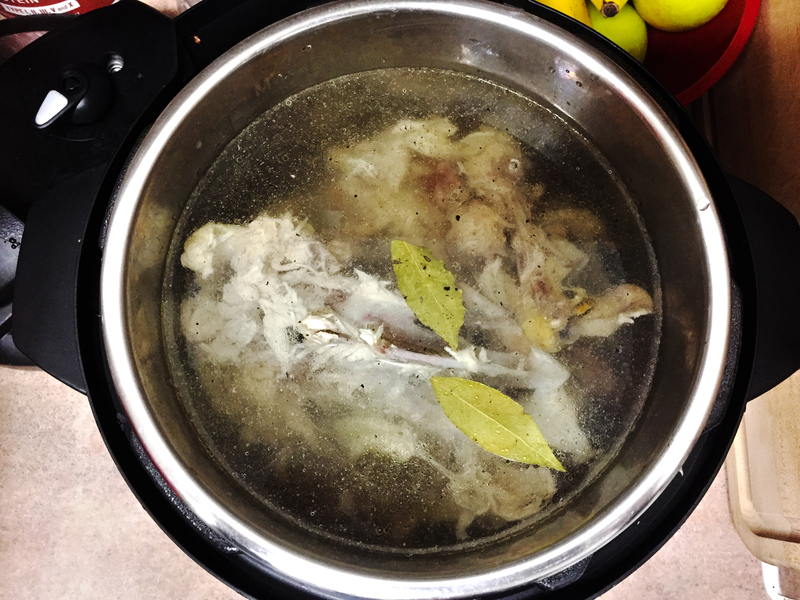 Place the bones in a slow cooker and add about 4 quarts of filtered water to the pot. Add some garlic and onion powder (maybe 1-2 teaspoons to taste), some salt and pepper to taste, and 1-2 bay leaves. I also add 4-6 tablespoon of apple cider vinegar. Cook the bones and water at a simmer for about 20-24 hours. It takes awhile to get most of the bone marrow and goodness from the bones, so don’t skimp on the time factor. If the water gets low you can add a little more. When time is up, remove the bones and pour the broth into mason jars. It should last about a week when sealed properly and refrigerated. You can freeze it up to 6 months. Place a whole chicken in the crock pot and cover with water until the bird is covered. Add whatever seasonings you would like to season the meat with. This could be garlic powder, onion powder, salt, pepper, oregano, etc. It really doesn’t matter. It just depends on what seasoning you like. Also add 4-6 tablespoons of apple cider vinegar. You can cook the whole chicken for about 24 hours. When time is up, let the chicken cool and then pull the meat off the bones to eat. You can put it on top of a salad or add the meat to some other recipe. Discard the bones. Then save the broth in mason jars in the fridge up to a week. Most grocery stores sell different types of bone broth. 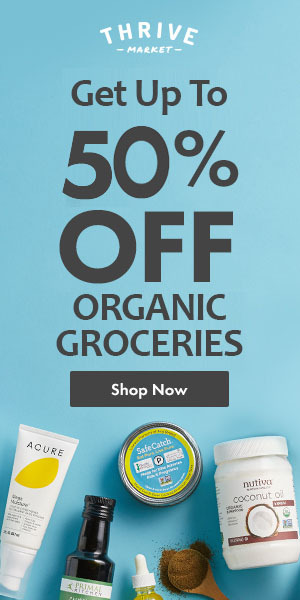 Thrive Market, which delivers to your home, has a great organic chicken broth and turkey bone broth as well. If you don’t want the liquid form of broth, you can also order a super healthy bone broth powder online. There are 40 different flavors like chocolate, turmeric, and salted caramel that you could add to main dishes or smoothies. Click here to see the selection! I personally use the flavorless collagen in my coffee every morning, and it helps my joints. I hope you find this post helpful. Please post your favorite ways to make chicken broth below! And don’t forget to share this healthy information with a friend or on Pinterest.